A search for the world’s most expensive taco turned up evidence of a previously offered filet mignon based dish from the Brentwood Restaurant and Lounge that demanded $38.50. But a quick verification check shows that the current menu no longer offers the taco in question. Apparently, the filet mignon wasn’t all that, and the reviews were less than glowing. So they let it go. Sounds like there is a claim available out there for anyone looking to create a superlative menu item. Then again, there’s always Taco bell for about $.69. I thought it would be easy to find the World’s Largest Taco, but it seems there are many different categories out there. 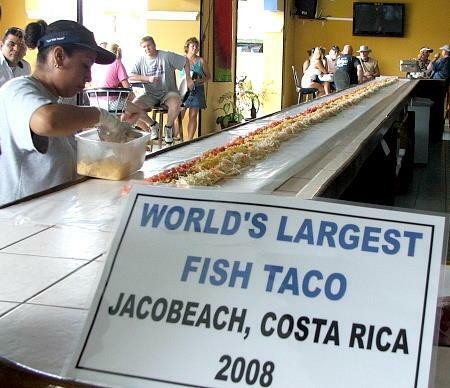 So today we will celebrate the largest Fish Taco, the 20-foot long, grilled mahi soft taco from Jaco Beach, Costa Rica. I was skeptical when I saw the teaser on the Today Show, I’ve been eating tacos for quite a while and figured that I already knew a thing or two. But after watching the segment, I figured it was worth sharing. The gist is that if you line your hard taco shell with a single piece of lettuce, it will trap the ingredients so they won’t explode and end up on your plate. Now, I am a bit of a purist, and will always opt for crispy shredded cabbage instead of a single soggy lettuce leaf, but it does appear the physics are correct and this would work. I promise to try it out myself, and here it is for your own viewing pleasure. 30 Day Blogging Challenge is On! Well, this will be quite the task. 30 day and 30 blog posts. I’ll do my best to generate something interesting about the world of tacos each day. Reviews, ideas, news, ingredients, pictures, videos, whatever. Hold on for the ride. One of my favorite places for delicious mexican food is at La Casa de Lisa. Now don’t even bother trying to google it, because it’s not open for business, it’s the kitchen of my friend, who lets just say, has a passion for mexican food. cheese — the white crumbly kind, of course! yes, there are eggs under all that goodness! Ra-wha? Rajas! A mixture of roasted peppers, onions and cream, slowly simmered and topped with salt, pepper and cotija cheese. Once you try rajas, you’ll start to invent other places to use it as a topping, its that good. MMMMMMM, my favorite way to start the day. 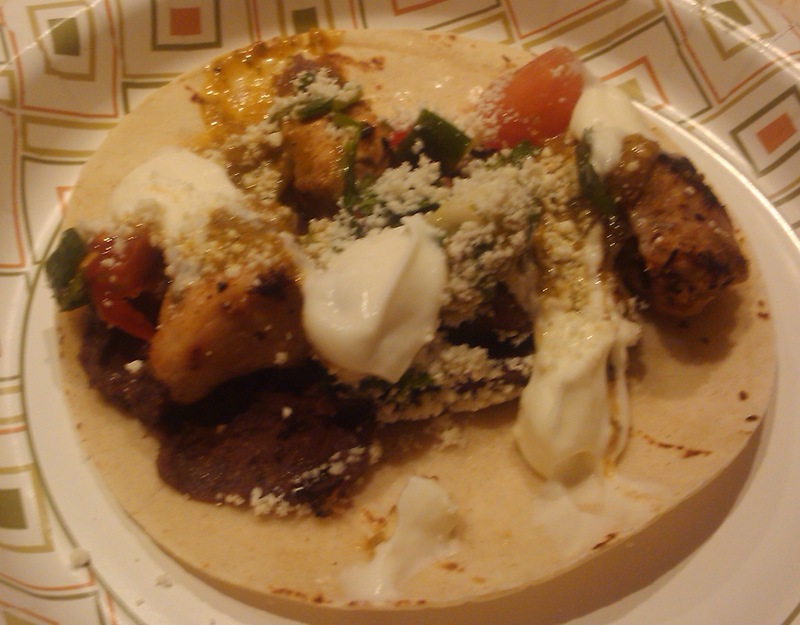 Many people love americanized mexican food. Who hasn’t enjoyed a pile of tortilla chips smothered in melted cheese, a taco salad or a mexican pizza? And (full disclosure here) I admit to stooping to the point of melting 1 LB of velveeta cheese, mixing in a can of Rotel chilis, grabbing a bag of Tostitos and serving at parties as chili con queso. Usually to rave reviews. But if you’re looking for a way to eat in a more traditional fashion, I can offer these quick ingredient suggestions to achieve a more authentic dish. While sour cream is an ingredient of crema, the inclusion of additional cream or buttermilk makes this a far superior topping to just straight-up sour cream. Its a staple in mexican markets, or there are a number of online recipes you can try, but it takes some time for the natural cultured bacteria to acidify. So just do yourself a favor and pick up a jar instead. 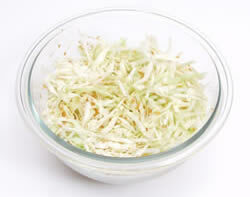 Lettuce is often used as a filler in the american versions of mexican dishes and usually doesn’t really add anything from a flavor perspective. Real cabbage, either green or red, will give your food a tasty crunch. Just be sure to shred it and use liberally! I’m always disappointed when I order something from a mexican restaurant and it doesn’t have any cilantro in or on it. 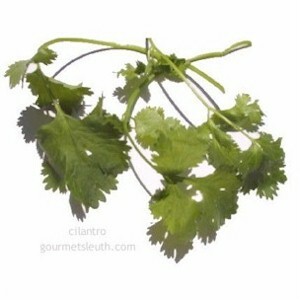 Cilantro has been used for thousands of years to give a fresh and spicy lift to a variety of dishes. And although the herb has a “love it or hate it” reputation, haters can certainly be turned with just a little exposure. More full disclosure, I used to be a hater, but now I always have cilantro in my kitchen! TIP: when you purchase cilantro to have at home, the best way to store it is in a glass of water in your refrigerator. It will last a lot longer and remain fresh for up to a week. There are a number of different types of cheeses that are truly authentic, but the rule of thumb is to go for something white and crumbly, not smooth and orange! And forget about the shredded cheese bags that you can find in the grocery store that label themselves as a “mexican blend”. 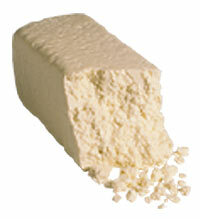 Anejo, Cotija, Panela, and Queso Fresco are my favorites, so experiment and decide which one works best for you. One of my favorite sources of authentico mexican foodstuffs is Mexico Market in Homestead. Located right near the Homestead campus of Miami Dade College, this market has good produce, meats and cheeses, lots of imported non-perishables and most importantly, a fresh tortilla maker. 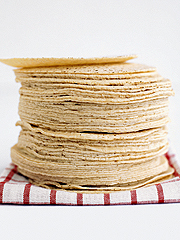 Tortillas are sold by weight and come right off the conveyor belt and into your shopping basket. Eat immediately for best results! I was also amazed at the selection and sheer mass of pinatas hanging from the ceiling, if you’re thinking of having one for a party, this is the place to go. Address: 407 Park Place and open 7 days a week.